Check out our new “Performance Calendar” page! Hope to see you all there! June 2012 – Jazz on The Patio Dates! Summer is in full swing at the Hotel Fredonia’s “Jazz on the Patio”! Join the Mix’n Matches in June for a drink and some cool jazz. Catch The Mix’n Matches Jazz Quartet live if you’re free for lunch on Friday – May 11th! We start playing at 12Noon downtown Nacogdoches. 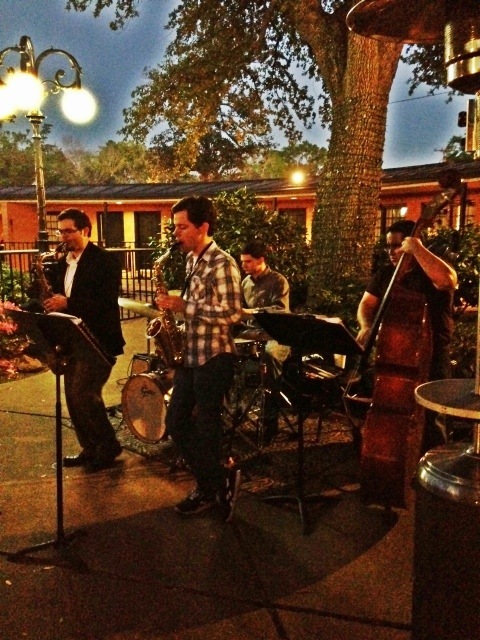 May 2012 – Jazz on the Patio Performances! Come catch The Mix’n Matches live at the Historic Hotel Fredonia this May! Featured Performance at the 25th Annual SFA School of Music Extravaganza! Looking forward to performing at the 25th Annual SFA School of Music Extravaganza this Thursday! If you’ve got tickets, you’re in for a treat as we break out the swing dance tunes with a some great ballads. If you don’t have tickets, catch us on the Patio this Saturday 4/28/ 2012 from 7:30 to 10:30pm! The 8th season of the Hotel Fredonia’s Jazz on the Patio Series is in full swing! Come check out the Mix’n Matches Jazz Quartet during the month of April! Come checkout the Mix’n Matches Jazz Quartet this Friday at the Historic Hotel Fredonia! The music starts at 7:30pm. See you there. One more set left!! Come on out to the Hotel Fredonia! We had some great crowds this February so we’re looking forward to a great March on the Patio! Come checkout the Mix’n Matches Jazz Quartet in March and enjoy the Spring weather with some great food and a drink or two. *ALSO* Check out our added videos in the Audio & Video Sample section! Looks like the weather is warming up and it’s time to get back out on the Patio! Come checkout the Mix’n Matches Jazz Quartet in February.